But then World War II approached, male reporters went into the service, and Windham went to work at the Journal and the Advertiser as a police reporter. She has been writing furiously ever since. Many know that her first book was Treasured Alabama Recipes (1967). Few know this was followed by Treasured Tennessee Recipes, Treasured Georgia Recipes and Southern Cooking to Remember. Alabamians have loved 13 Alabama Ghosts and Jeffrey. Few realize that she also published three more Jeffrey books and books on the ghosts of Mississippi, Tennessee, and Sloss Furnaces. Windham was a professional, writing for a living, publishing, finally, twenty-nine volumes. And she was writing right up to the end. Two years ago Windham published Spit, Scarey Ann, and Sweat Bees, a slim volume of memories of her childhood with many fascinating family photos. 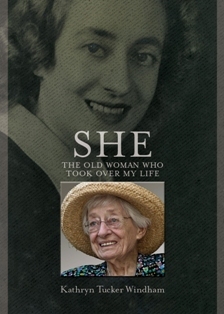 Further, at the time of her death at ninety-three on June 12 of this year, she was finishing this book, She: The Old Woman Who Took Over My Life. She contains a variety of reminiscences of the recent and distant past, but it mainly concerns the changes involved in aging. Windham was, enviably, ninety when this became a problem. That was when the alter ego “She” came into the picture and took over her life. Windham writes, “I can’t recall when I became aware that an old woman was nudging her way into my life.” The arrival of this old woman caused problems. “She disrupts my plans, demands my attention, shames me into completing abandoned projects, requires nutritious meals…hides things from me, makes my handwriting less legible….” And so it goes. But she adjusted. Everything takes longer and it becomes difficult to reach and get things, from the lowest shelves and, because one is shrinking, from the highest. Packages of peanuts and pretzels on airplanes, to say nothing of prescription bottles, are a nightmare to open. More naps are needed. Exercising with cans of soup in lieu of free weights is necessary. Windham happily reveals a number of slightly odd practices she and “She” had taken up. Windham had a coffin built for herself by her friend the craftsman John Moss, but since she is “not in a hurry to use it” and it is not needed every day she keeps her good china and Rose Point crystal in it. Since she bakes less, the oven is for storing canned goods.